All Unitarian Universalist congregations are self-governing, self-sustaining entities. This means the final authority over all church matters rests with the congregation's members themselves, including whom to call as Minister. Leadership responsibility is delegated to elected representatives on the Board of Trustees who oversee the Minister. The Minister oversees all staff and operations, and supports the work of the Board of Trustees and other congregational committees. Bradford Community Church UU Board of Trustees is charged with the leadership of the congregation, sets and reviews goals, monitors the executive staff, approves budgetary concerns and supervises all volunteer committees. Trustees are elected at our annual congregational meeting in June of each year. 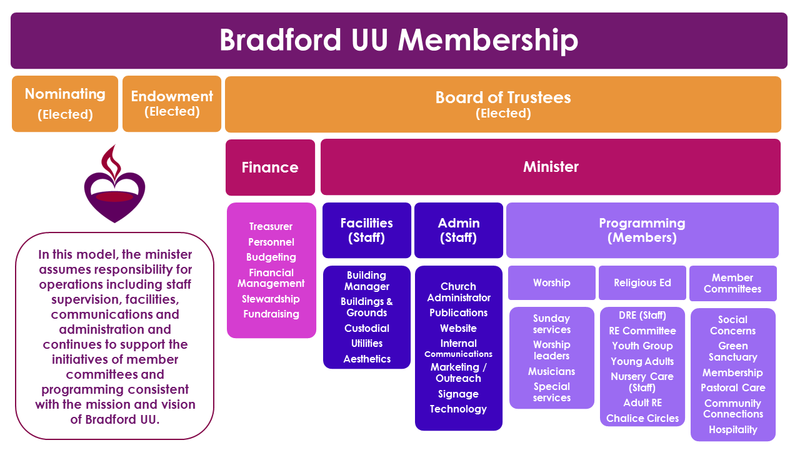 Bradford UU has a number of committees dedicated to specific areas of congregational life and programming. For a complete and current list of our committees and their contact person, please view the latest edition of our Quilt Newsletter.